Do you have one of those hard to buy for people on your gift list this year? Or are you trying to get that spouse or bestie to join you in your running craze? Corrigan Sports makes it easy to gift a race entry to anyone on your list. 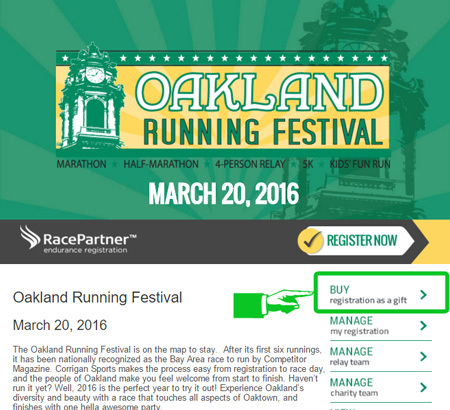 Giving the gift of running is easy with our gift registration codes good for entry into the Oakland Running Festival or any of our running events in 2016. Just fill out the name of the recipient and either download the registration certificate and present your gift in person OR have it sent directly to them via email. The recipient will not see the price of the registration only that you have gifted it to them. Their bib is not reserved until they actually use the code to register. This allows you to purchase the gift knowing only minimal personal information that is required for race registration.To buy a gift registration click the option highlighted below on our registration website.